Hi folks. 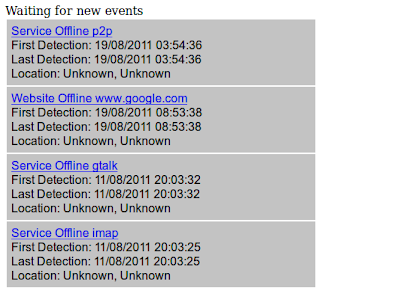 During this Google Summer of Code 2011 I have been developing OpenMonitor Cloud Aggregator. It was a good experience, as I learned to work with new tools, like GoogleAppEngine, Protobuf, Django, and the work was developed in a team. 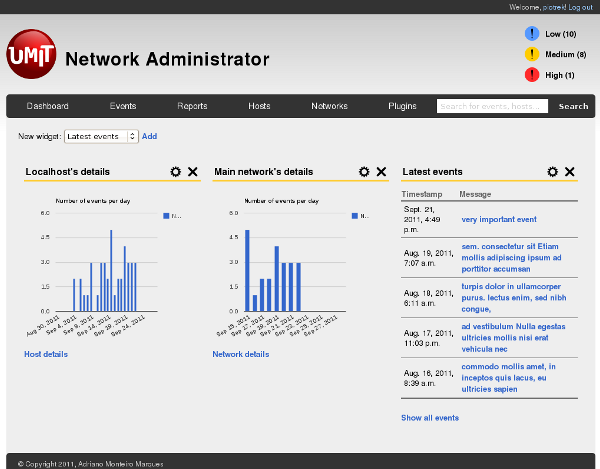 The OpenMonitor Cloud Aggregator is the central piece of the OpenMonitor, as it collects all the information sent by the agents (both desktop and mobile), analyses it, and launch alerts if some event was detected, like a shortage or a blockage. The Aggregator is also used to share the information with the users, control the release of agent versions, receive suggestions for websites and services to check. 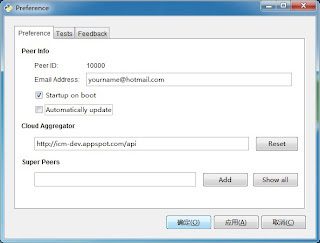 This software was developed using Django Non-Rel (Python), uses Google Protocol Buffer to trade messages with the agents, and was deployed in Google AppEngine. 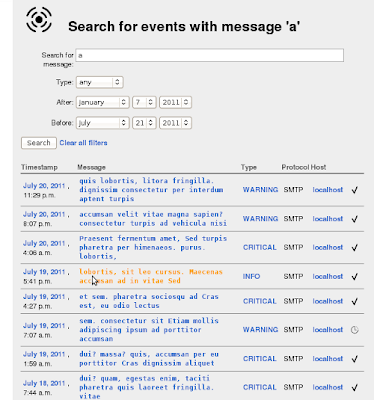 The Realtime Text Feed is a simple page that lists all the recent events, and every time a new event occurs, the main information about the event slides to the top of the list. 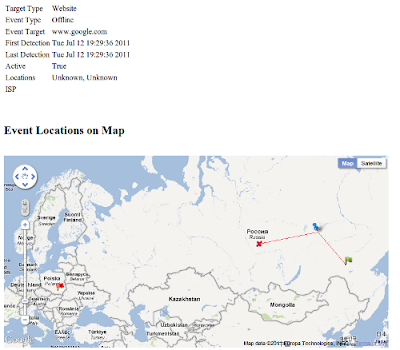 Like the Realtime Text Feed, the Realtime Event Map is a simple map that displays the events marked with pins. Every time a new event occurs, a new pin popups in the map, and if the user clicks on it, he will be able to see more information about that event. 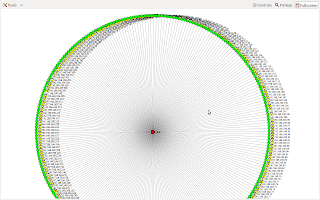 To don't overload the map with pins, the near pins are grouped together, and instead of a pin, a circle appears with the number of events occurred in that zone. 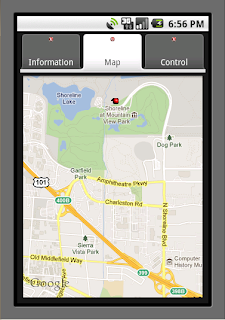 If the user click that circle, the map will be zoomed it to that region, and the pins will be show alone. 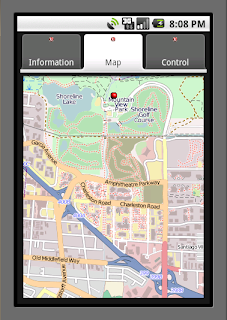 In the next image is shown the full map, and then the same map after zoomed in. The users will be able to subscribe the events that they want to receive. After the subscription is done, when a new event occurs that matches the subscription, a new email with the information about the event will be sent to the user. 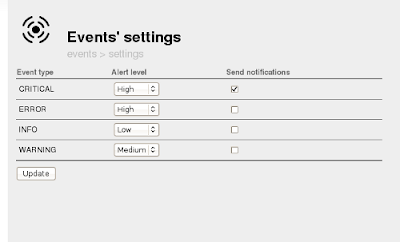 All the previous notification system only show to the user the main information about the event, however a link to page with detailed information will always be present. On this page is shown the target type (website or offline), the type of event (blockage, censor), the time of first and last detection, the name of the location, the name of ISP used by the agent, and a map with the location of the agent (green flag) and the target (red flag), the path used (in red) with the hops represented by the blue icon, and if the event was a blockage, the place where the communication was blocked is represented by a red cross. Hi, I worked as GSOC 2011 student with UMIT project. I worked on UNS, UMPA and ZION as part of my project. The start was a little bumpy, but all is well that ends well. In this post I'll explain the work done during this summer. 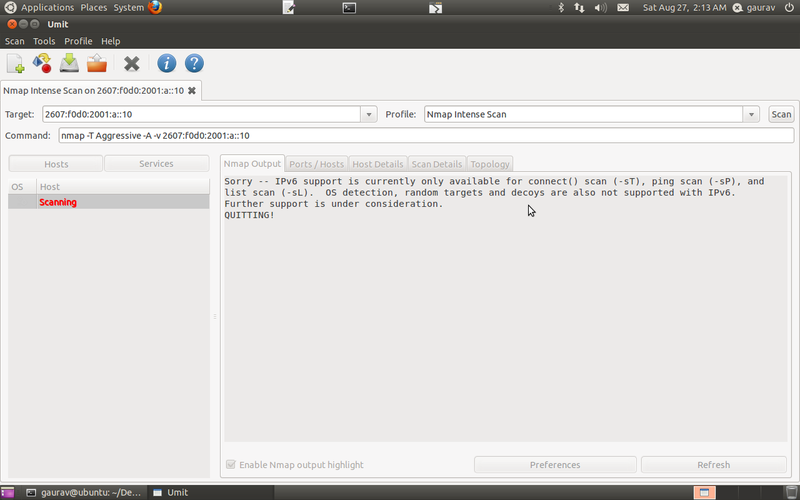 Support for IPv6 : nmap supports IPv6 (baring some options), but the support was missing from UNS. 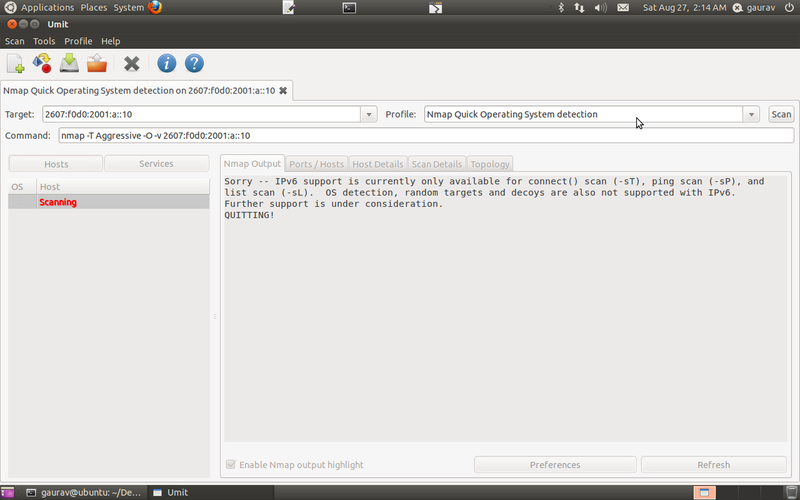 For the options that are not supported by nmap we display an error message with appropriate information. 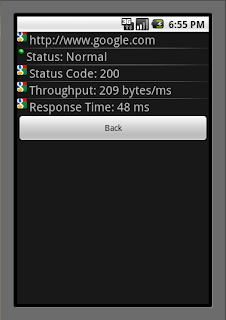 Screen Shot of IPv6 Scan (done on testbed of 2 computers). It uses the address checker implemented in zion. Scan Detail Improvements: Active and inactive nodes are shown in green and red respectively in the display column. >>payload.data = "this is umpa!" It set this device same as for capturing the packet . and a domain name list (containing top level domains). 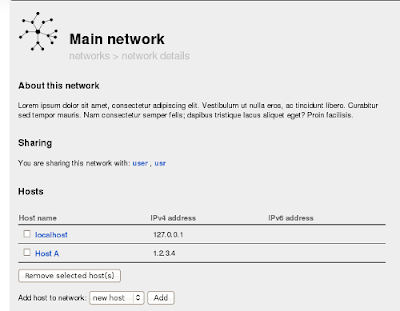 Here are Screen Shot of Zion scan with two different public IPv6 address . After three months of coding the Network Aministrator is ready to go. In this post I would like to describe some of its features. Since the project is now open to the whole community, I will also write about a major tasks for the next few months, where your help would be very appreciated. As some of you may know, the name for this GSoC project was "Network Administrator to the Cloud Land". The title outlines the basic concept of the NA, which is creating monitoring tool that will work in a computing cloud as a web application. This idea seems to be very simple, however a product like that hasn't yet been created (correct me if I'm wrong). But why should we care about developing such an application? Well, computing clouds give us cutting edge scalability and reliability--the features that we are looking for while creating a monitoring tool, right? Moreover, web interfaces provide us with high availability and usability at the same time. In Network Administrator we are using these qualities and we take monitoring software to the next level. Now I would like to present you some of the basic terms and concepts we're using in NA. An Event is a single information about what happened on a server. 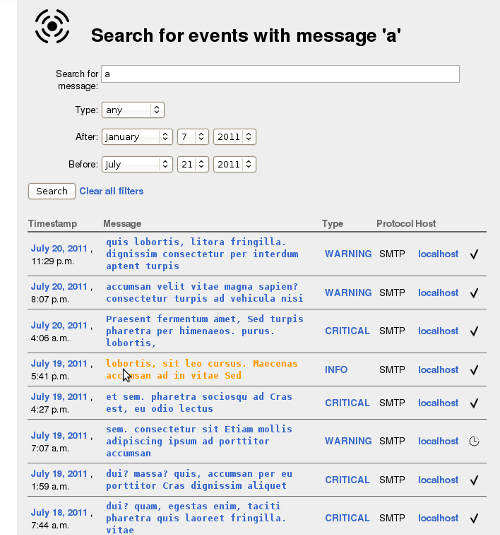 Description of event contains a message (and its shorter version), type of event (e.g. 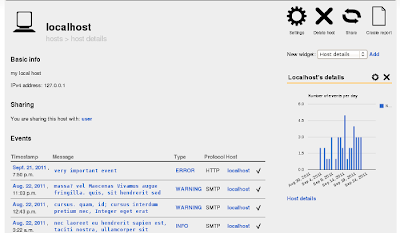 "WARNING"), time stamp, name of network protocol, source host and optionally some additional data serialized as a JSON . Based on these data we should know everything about an event: when, where and what happened. Monitoring a network is a very ambiguous term, therefore monitoring tool should be a highly extensible software, to let user easily define what data he wants to see and how. With the basic knowledge of Python and Django template language you can create a plugin that will show additional data about events or networks. Or it can show the same data but using different representation, like a chart. There are lots of possibilities now, and there will be much more of them in the future. Django is a powerful and mature web framework, so I had no doubts to use it in the Network Administrator. 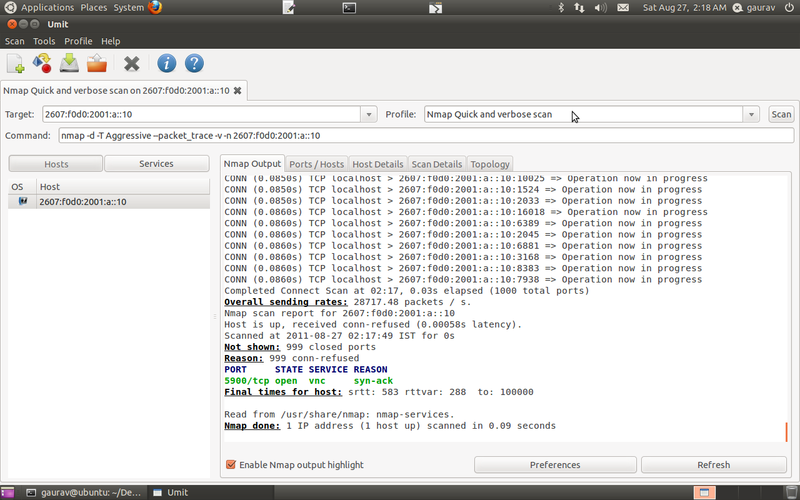 However, this project is different than any other application I've done before--it is entirely based on NoSQL backend. Using non-relational database we can create system that is quicker and lighter. Besides, it's much easier to change data model during development process on database that is horizontally scalable. Unfortunately Django doesn't support NoSQL backends by default. But there is a cool project called Django-nonrel , created to meet this requirement. Its authors claim that the latest release is stable. 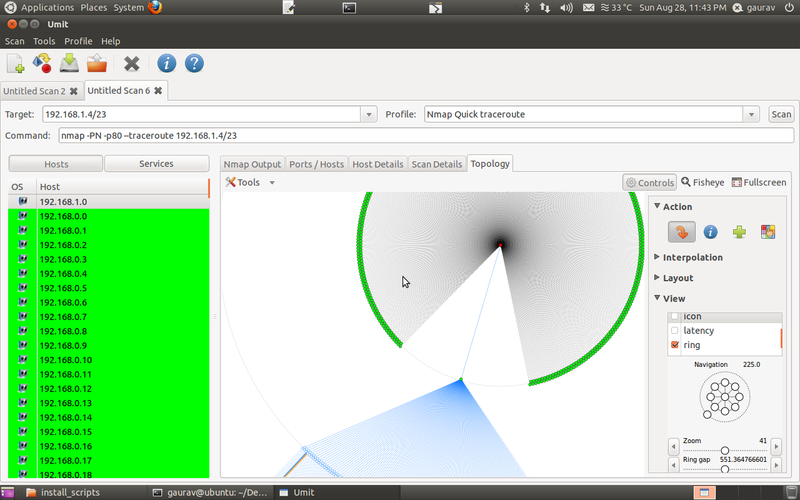 Indeed it works well and I think we can use it in production environment. As I wrote above the web API is a crucial part of the NA. It was implemented based on Piston framework . Using this simple Django application we can easily create RESTful services by defining handlers for GET, PUT, POST and DELETE methods. It also provides nice authentication backends, e.g. OAuth. For generating reports we are using Geraldo Reports--another Django application  with lots of nice features. Since the Network Administrator was designed to work in a computing cloud, I had to test it in one of those. The Google AppEngine seemed to be the perfect choice. Why? It is completely free to deploy there startup application like this, it has great documentation and it provides services like e-mail, cron, database viewer etc. Thanks to Djangoappengine  app I could easily set up NA on Google's servers. One of the most important lesson I learnt during development of the NA was to use NoSQL databases. At one moment I had to forget about JOINs, many-to-many relations support, full-text search etc. Now I have to admit it was quite amazing experience, that learnt me to focus on every single query I write. Now I would like to show you some of the most important features of the Network Administrator. Hoping that some of you may be interested in contributing to the project, I wrote a short TODO for the next few months. It's not a complete list of tasks but it shows major priorities for the Network Administrator. Does anybody here believe that "the Network Administrator" is a final name for this project? No way! It should be short and catchy if we want to efficiently promote this idea. We should write much more tests for all of project's applications. I'm also aware of need to spend more time on code refactoring. The goal is to create a very good-looking interface with a cutting-edge usability. It's the easiest way to show people that our project pretends to be the high end web tool. To reach this goal we have to find (hire?) a professional graphic designer. Regardless of the plan to create a new layout, we should think about new features that would make this tool more usable and user-friendly. It's easy to extend the NA with plugins so we just have to think: how to make NA a monitoring tool that we would like to use? To start just register a new accout at http://ns-dev.appspot.com/user/register/. After pressing "Register account" button you should receive a mail with an activation link. Click it and that's it--you can log in! Then set up your servers to report events to your account . 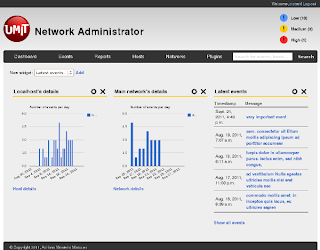 Now you can monitor your network the way you never did! 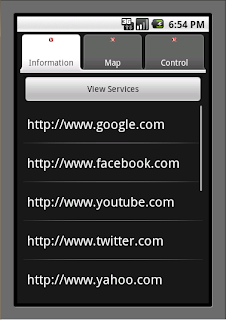 Like the websites list, a service can be selected to view scan details. Engineering the ICM Mobile Agent this summer, I encountered a number of challenges which were both exciting and nerve-wrecking at the same time. Working on a mobile platform and application places one in a unique situation because one does not have access to unlimited resources and power, and various code libraries. As a result, one needs to be mindful of various run-time quirks that can significantly reduce the efficiency and usability of the app. In this post I am going to retrace my path through the course of the summer and highlight three significant hiccups that I faced. 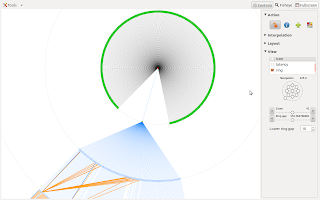 Most networked applications make use of cryptography in one form or the other. Important among these are encryption and authentication. For both, one has the option of using either public or private key cryptography. Though the end-goal might be the same, the algorithmic differences between the two can have major performance differences. For example, in one instance RSA public encryption/decryption of a 20 byte String took 5987/4471 ms, respectively. In contrast, AES secret key encryption/decryption took 22/13 ms, respectively. Clearly, the latter is many orders of magnitude faster than the former. In an application which encrypts every communication message, the choice of the encryption algorithm can make a major performance difference. 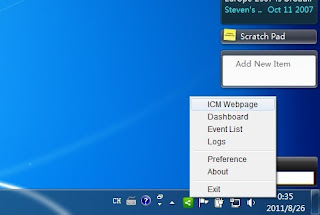 As an integral work horse of the ICM, the mobile agent runs connectivity tests for every monitored website and service. The periodicity of these tests can take its toll on the battery time. Naively running these tests one after the other will drain the battery in no time. Therefore, it is important to be aware of some of functional aspects of your application and how to optimize them. Selecting a good periodicity interval using manual profiling can help to conserve the battery. The frequency with which your application communicates with other entities in the network can also affect battery consumption. Therefore, a communication model in which the mobile client initiates communication by consuming a RESTful webservice API in a request/response model is the most efficient for two major reasons: 1) It puts the client in charge of the communication by allowing it to start communication if and when required without any polling cost, 2) It pushes the computational cost of some intensive tasks from the client to the server. Working on the Google Summer of Project with Umit has perhaps been the best learning experience for me. I am a Computer Engineering undergraduate and in our course of study, we learn about a lot of theoretical concepts and ideas. Working for this project has given me an opportunity to apply those concepts into an application that will be helpful to many users. It is a true practical application of what is in books. I got to spend a lot of time with low-level networking stuff while writing the port scanner. At one point of time I could even read raw packets and infer the flags without even looking at the reference. It was a really good learning experience. Even though I am done with Google Summer of Code, I would really be interested in continuing the development of this project in the future. Its an interesting project and mobile is the future. And now that almost all our phones run Linux (Android :P), we should have more control over what we can do with them. This application is a very good example of exploring the power of Linux on handheld devices. So, Google Summer of Code 2011 came to an end a few days ago. I hope it was a very fun summer for all GSoC students out there. For me, at least, it sure was. I got to work at a project that caught my attention in the pre-application period as having the potential to be a very educative experience for me. And it was, not only because of the project itself, but because of the great community here at the Umit Project. I would like to thank Adriano, Luis and of course my mentor Rodolfo for being helpful and supportive during this summer. I have learnt a lot of useful stuff: network programming (and also Twisted Matrix with it), a better understanding of Python programming, packaging and installation procedures and of course, some improved debugging skills with all of it:-). But most important for me, being a very disorganized person, I learnt to organize my time much better working at such a project. 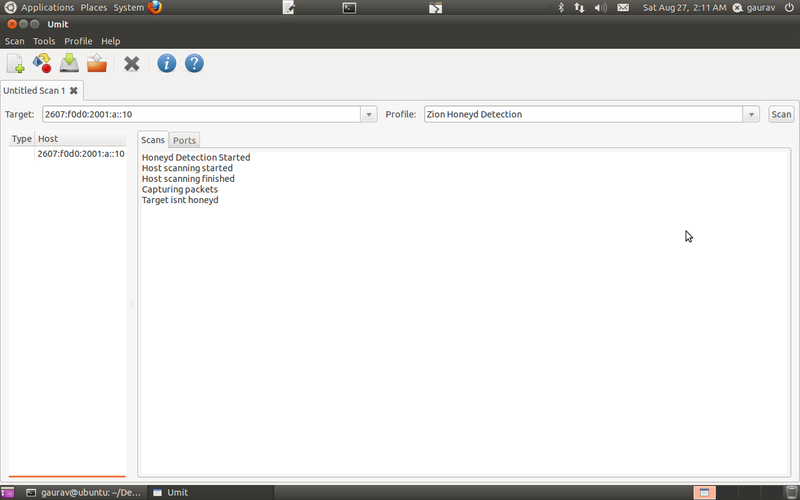 Network Inventory Agent. A daemon/service that is installed on the host that should be monitored and sends out notifications when something happens. It offers an modular design so the users can add new monitoring functionality based on their needs (or better said, on what is needed to be monitored on that host). Network Inventory Server. 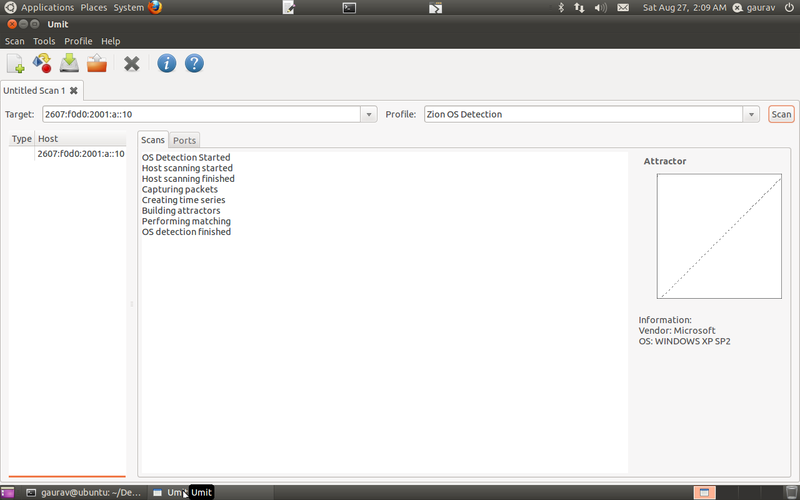 Also a daemon/service that receives notifications from the agents installed on the monitored hosts. It stores those notifications and provides an interface so other applications can view them. 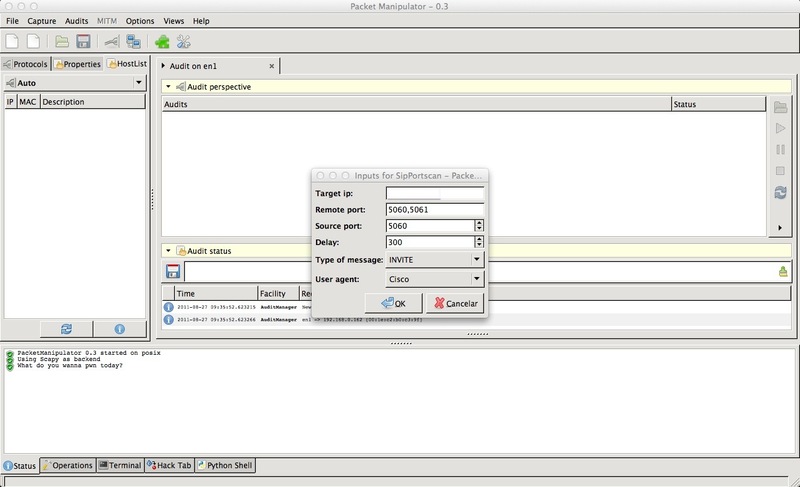 Besides receiving notifications from agents, it also provides support for SNMP Traps and it can even be extended to support new monitoring protocols. 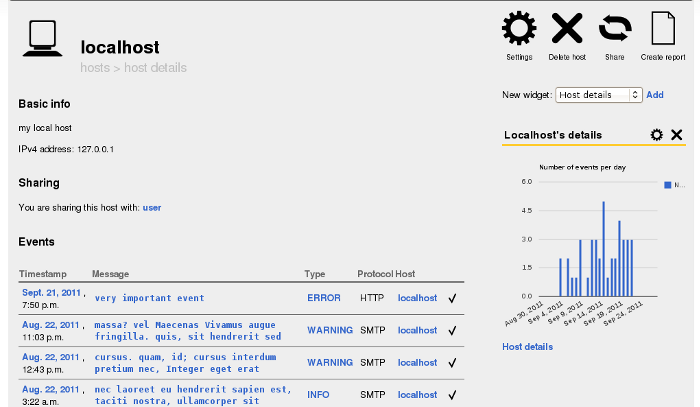 Besides these 2 main components, a Network Inventory frontend was also developed that connects to the Server Interface and allows the user to view notifications, search trough them, edit server and agent configurations and view host information. A Device Sensor agent module that generates notifications based on some device variables: RAM Load, CPU Load, HDD space, network traffic, open ports and others. The user can define under what conditions should a notification be generated. For example, you can say that you want a notification sent if the CPU% is over 90% over the last 5 minutes, if the remaining space on drive C:\ is under 10GB or if less than 1KB of data was received in the last 30 minutes trough your network connection. 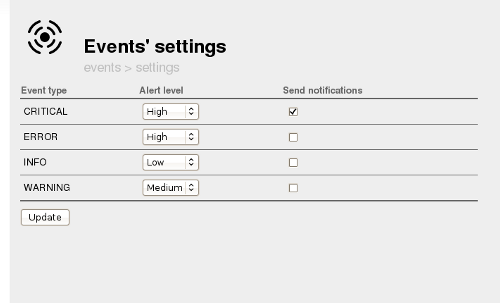 Some examples of course may not be interesting and relevant, but the conditions under which notifications are sent can be customized to your needs. Possibility to encrypt the notifications sent by the agents to the server and the data between the GUI and the server. 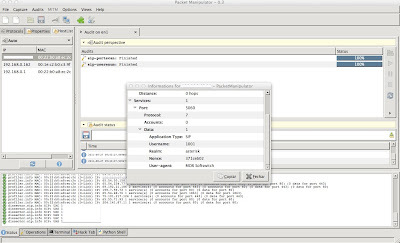 An EMail Notifier server module that sends e-mail notifications for some pre-defined notification types. A SNMP server module that allows the server to receive SNMPv1, SNMPv2c and SNMPv3 Traps/Notifications. 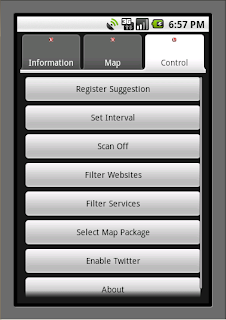 For the Network Inventory GUI, I will just post some screenshots here as I think it will better describe it :-). JUnit test suites in Android constitute a separate Android project that is deployed alongside the application under testing . Users often make the mistake of adding external libraries as dependencies to both projects which leads to java.lang.VerifyError failure caused by the conflicting external library. In case of Eclipse, the standard solution is to add the external library as dependency to only the main project and then export it to the test project . But unfortunately, this solution is not applicable when Maven is used to run the test suite . In case of Maven, the user should add the external library as dependency to the pom.xml of both projects but with different scope options. A compile scope dependency is propagated to all classpaths of the project and at runtime is available to dependent projects which list the dependency scope as provided. In this post, we are going to build upon my previous post on using Maven as a build manager for Android projects. Google Protobufs have recently found traction in serialization of structured data. It automatically produces code in C++, Java and Python from .proto file for use in user programs. A proto file consists of messages that are compiled using the protocol buffer compiler to produce code with getters, setters, builders etc.. The user is directed to the Java Protobuf tutorial for more details. Replace path_to_proto with the path your .proto. Having taken care of dependencies and automatically build, now, let's focus on the .proto itself. where org.x.x is the Java package to which the resultant "Filename.java" should be added. int32 is compiled to a Java int while int64 is compiled to a Java double. Note that optional fields can be skipped during a message build while more than one repeated field objects can be added as they constitute a Java List. In addition to these methods, standard get, set, has and is methods are also provided. 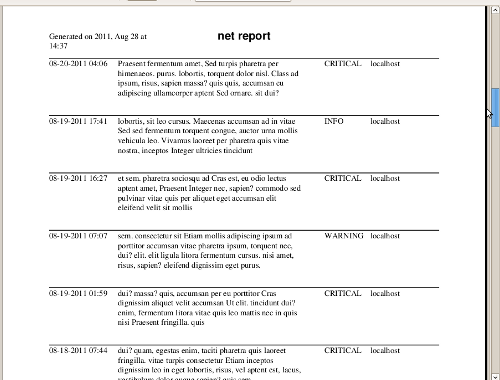 My project for Google Summer of Code - The mobile network scanner requires the use of libpcap or tcpdump. I was successful in compiling libpcap from its source and loading the library to use the native functions in JNI. But since an Android application does not run with Root privileges, it is a challenge to get the native functions to work in the same process. The native code and the Java code for an android application runs in the same process. So the native code does not have root privileges. So as of now, it is not possible to get libpcap functions to work using the NDK. But there are alternatives which I will be suggesting in this blog post. First of all, here are the instructions to successfully compile the libpcap.so library for use in the JNI code. 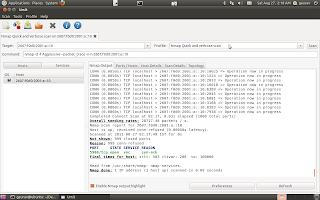 Create a folder called jni in the application root. Libpcap for android is built as a static library and its functions are then used as a shared library. A shared library build specifications are defined in the Android.mk make file in the JNI folder of the project. The JNI folder contains the make files for the library. It also contains the native C code with function definitions according to the Java package. The native code needs to compiled with ndk-build command and requires the android-ndk to be downloaded from the official website. The reason for this error is that the native code and the application both lie in the same process. Invoking a "su" here would not work because an "su" just forks a new process that has root privileges but that process would not contain our native code. So a work around for this is that a binary or a unix library should be compiled before hand and then supplied with the apk. The binary can be extracted from the apk. The binary may require root privileges but it would be as easy as forking another process with "su" command. For now, I am just sticking to tcpdump for the requirements of this project. If we need a specific implementation of packet sniffing from libpcap, the plan is to compile a binary or a unix shared library and supply it with the apk.